The pipes, sissy bar, points cover and struts are all one off parts. I did the paint myself with a $7.00 paint gun in a temporary booth I built in my backyard. No decals. what type of pipes are those on ur sportster? Where did you get the exhaust pipes? Funny you should say that ("I'd change the tank") because I actually did change the tank. 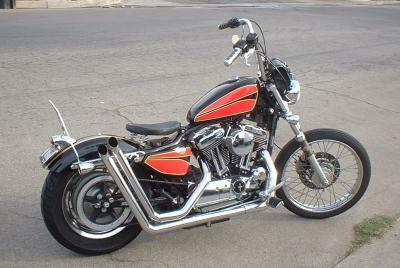 I never liked the "new and improved" tanks Harley started putting on the Sportsters in '04. Way too big and fat. Personally, I've always liked the traditional Sporty tank. To each his own though, right? That's what makes customizing so much fun. love the paint job, but i'd change the tank. i've always hated stock sporty tanks.